Important Payment Info: Even while you Order “Design Patent Drawings” Now using Online Form Below, you may choose to Pay Later upon completion of the draft. Having high quality accurate Design Drawings when filing a Design Patent application is indispensable to protect your intellectual properties. 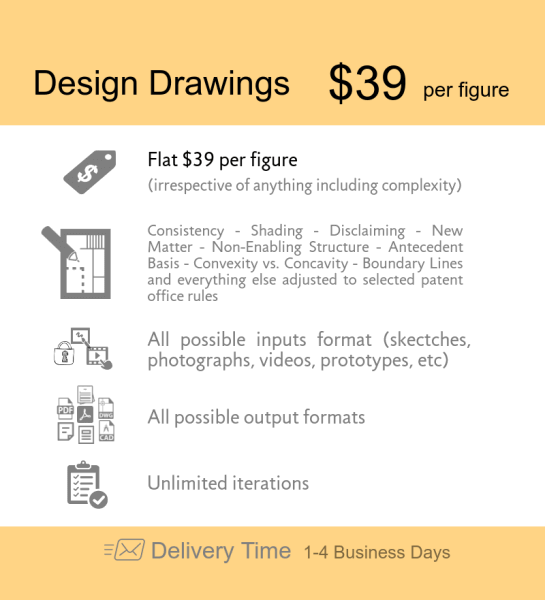 Keeping this in mind we come-up with a bouquet of customized patent drawing services that can help you draw exactly the one you are looking for. Willing to file a design patent application and looking for a design patent drawing company that can help you draw your ideas in paper then you are at the right place. After having served innumerable number of law-firms, corporations and entrepreneurs drawing their ideas in paper we have emerged as one of the most reputed design patent illustration provider in patent drafting domain. The patent artwork we prepare can be filed with the United States Patent and Trademark Office (USPTO), Patent Cooperation Treaty (PCT), the European Patent Organization (EPO) and numerous other Patent and Trademark Offices around the world.